Mr Consistent. Mr Dependable. Successful captain. The brains, brightness, guidance & solid rock wall of the team. The stabilising force behind the team success. The backbone of the batting line up. A dedicated responsible professional batsmen & human being who has wisdom & educational qualifications behind him. Pakistan cricket is in safe hands under his leadership with the potential to go far and reach new heights. He is not over emotional or shady like other captains we have come across. Operates analytically with clarity, perspective, hindsight, game awareness, calculated skill and a sound temperament. We are behind you Misbah! High class performer, thorough professional, ideal leadership qualities, commanding structure as a batsmen & terrific ambassador for game and country. Get Behind Team Misbah In my opinion, Misbah is one of the very few individuals in the side who is capable of handling the complexity of leadership of a Pakistan team. He comes across as one of the very few respectable, suitable, deserving & dependable figures who can control affairs on and off the field within the team. Well rounded individuals like him, responsible professionals who operate with intellect and remarkable consistency and possess captaincy traits and characteristics are found in rarity amongst Pakistan cricketers. He is by and large a controversy free character. He knows how to conduct himself & guide & groom the youngsters through his calmness, composure, coolness & level headed wisdom. He has cricketing braininess, tactical awareness & depth technical understanding on various aspects which he can follow and pass on. His decision making credentials and ability to extract the best from other members of the team is evident. He handles proceedings and reads match situations with adversity, thoughtfulness & perspective. He creates a trouble free positive team environment and avoids getting involved in controversies, hassle and unnecessary dramas. He interacts well with the press in an eloquent and down to Earth manner. He makes things happen on the field as we saw when New Zealand were bowled out in a single session of play out of the blue on Sunday 9th January 2011 in Hamilton. He leads from the front with example & authority, consistently and reliably. There are absolutely no queries regarding his performance. Personally, I don’t think much can beat this for a package of a captain. The results already back that up. Only 1 loss in 10 appearances as skipper. Long may his captaincy success continue..... I expect the team to continue to perform brilliantly under him. I predict he will have an undefeated test series record once hanging up the boots & a high % of LOI wins. It’s best to make full use of his services for however longer remaining possible. Ideally he should have been leading the national team a long time ago. Age is NOT a barrier. We need continuity & stability when we have found quality leader at the fore. Nothing bigger comes than having Pakistan Cricket in safe hands. The saviour of Pakistan Cricket after the spot fixing scandal, mysterious disappearance of a wicket keeper, unfavourable match outcomes previously & in an age of international cricket isolation. We thank Misbah for restoring direction, credibility, integrity, guidance, performance, stability & respect through his stature, captaincy & mind blowing personal contributions ever since the successful drawn test series with South Africa in the UAE. Salute the MBA batting master! A man the whole nation should get behind & be proud of. May the experienced campaigner & solid rock wall from Mianwali keep producing the desired goods for Pakistan Cricket. 1) Misbah Ul Haq has scored the most runs in test cricket by a Pakistan batsmen since September 2007 at an average of 54. 2) In ODIs he has been the 2nd leading run scorer by a Pakistan batsmen since September 2007 at an average of 45 and strike rate of above 80. 3) He has the highest average by a Pakistan batsmen at away and neutral venues in ODIs. 4) He has the highest average by a Pakistan batsmen in Test cricket at away and neutral venues over taking Younis Khan, Miandad, Inzy & Saeed Anwar. 5) He has only lost 1 in 10 matches as captain across all formats. 6) He recently just fell one short of equaling the record for the most consecutive 50+ scores in Test cricket history. 7) For those who argue he never does it on the big stage in LOIs need to look no further than the 2007 ICC T20 WC where he was the 3rd leading run scorer across the tournament and in the 2011 CWC where he was Pakistan’s leading run scorer with 3 50+ scores in 6 innings. He has only played one World Cup so how people come to such a conclusion is beyond me. Compare this with Afridi who has featured in 4 WCs and never scored a single 50+ score for instance or Younis Khan who has 2 50+ scores in WCs only. 8) Even in ODIs he has an excellent record chasing which does not tend to be associated with Pakistan cricketers. 38% of the time he has guided the team over the line & remained not out. 67% of the time he has been in the ODI side the team has won. 75% of his 50s have come in winning causes. 9) He has the highest individual score by a Pakistan batsmen in 20/20 cricket & has hit more 6s per match than Afridi! 10) He was VC of the 2009 ICC T20 WC winning team. He also holds an MBA degree. What he has achieved in such a short & late international career spam is extraordinary. Who knows what he could have been had he been treated more fairly in his earlier days & was indentified properly? He could have been up there with the best if his stats are anything to go by. What stands out for me is he is a well rounded individual in several walks of life. He is an excellent orator, highly educated, naturally possesses leadership qualities, has a burning passion for the game, never loses hope & knows how to make his talent count with such regularity. His self belief & mental toughness to come back hard & shut up his critics is immense. For example this time last year he was contemplating retirement after being ditched, but now he is leading a successful side and is the 2nd leading run scorer in world cricket for 2011 after Shane Watson. Similarly after the WC semi final where he was harshly criticised for his slow scoring, he came back hard to notch up 3 successive undefeated knocks of above 40*+ each time in winning causes during successful run chases against the West Indies. One of them was a tremendous effort on a challenging wicket with pace & bounce where he came to the crease in a crisis and batted all the way through with such composure & authority to seal the series honours. He showed the value of having a solid batsmen and handled proceedings with expertise. He has a very disciplined and controlled game plan/approach. He makes full use of all his experience & knowledge of the game & applies them when batting or leading. He is methodical, structured, watchful, determined & measured. He is able to think & plan one step ahead and consider the bigger picture. He prides himself on his powers of concentration, tight & neat defence, grittines, commanding structure with ability to handle proceedings & read situations well, mental strength, determination, application & patience to see out patches of play. He can sit in & play the waiting game when required, but also take some incentive, initiative & innovation otherwise. Surely the perfect blend and balance to have at the fore. Undoubtedly the best cricketing brain in Pakistan as Geoff Lawson mentioned. In the test arena he has improved the batting who are now regularly posting scores in excess of 300. He has injected a sense of discipline, application, determination, responsibility, gutsiness & fighting resilience in the batsmen who are willing to spend time at the crease, dig in hard & put a real price on their wicket i.e. Azhar Ali, Taufiq Umar, Asad Shafiq. They can now play out lengthy periods of time & sweat hard which has its own charm and significance in setting platforms, giving themselves every chance of making a substantial score & playing out long sessions confidently when the odds are against them. There is resilience and stability to take the innings to over 110+ overs so they can make opponents really work & eventually go on to earn respect by dictating terms. A classical but workable approach has been adopted. Under Misbah’s captaincy Pakistan have post their highest ever 4th innings total, played out 3 5 day draws when they were on the back foot in the match & were positioned in tricky situations and have even had the opportunity to declare an innings which they have not done since 2009. This is worthy of credit & appreciation as test match batting disciplines have not always been associated with Pakistan batsmen. Now we are seeing some really encouraging and heartening signs ahead of future series. On top of all of this he has an excellent domestic record as skipper and therefore has tons of experience & knowledge in the field so much to the extent that he was named skipper of the test team when he wasn’t even in the team previously. He is a natural born leader of men & good role model as a player and person. He also has an “eye” for talent & indentifying attributes along with requirements. He recommended Saeed Ajmal for national selection when he was vice captain of the 2008 Asia cup team when the team did not have a front line specialist spinner. Now look how far Ajmal has progressed & gone as a player for Pakistan. Without Misbah’s persuasion and recommendation it is unlikely he would have represented Pakistan. Many other players have also expressed great gratitude and appreciation towards Misbah for advancing their careers and providing them with the necessary guidance & confidence to raise their game. Today I watched the extended highlights of the Mohali semi final. I can now clearly see Misbah was the only Pakistan batsmen who did not sink under the pressure & actually put a price on his wicket. When he was still at the crease during the batting powerplay the Indians looked worried & concerned. You could see it at the back of their minds and on their faces. They genuinely feared him because he had his eye in & had mastered the bowlers & conditions. The over before the BPP Wahab Riaz played out 4 dot balls swinging and then got out on the 5th ball when the equation was 62 needed from 6 overs with 3 wickets in hand but after that it became 61 required from 5 overs and Misbah was left with just 2 wickets. Misbah was instructing Wahab Riaz not to back away & look for room but Wahab was not listening & wasted a crucial over. Also YK played an atrocious innings. Not only did he go at a slow rate, but instead of setting up the chase like a proper solid top class anchor role batsmen by preserving wickets in hand & keeping one end closed, he threw his wicket away & played an uncharacteristic shot. If you hear Ravi on commentary before the drinks break, he was saying if Umar Akmal & Misbah stay at the crease till the 40th over and just go along at a steady rate till then Pakistan can seriously challenge this target by having at least 5 or 6 wickets in hand and chasing under 10 an over which is not that hard of a challenge in modern day cricket with the introduction of T20 in the last 10 overs especially with the batting powerplay still available. However, by the 40th over Misbah was still there whereas Umar Akmal & both Razzaq were back in the pavilion playing down the wrong line. 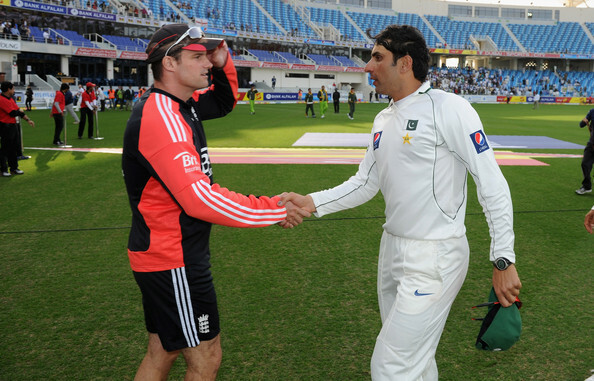 Due to Misbah's quite easy going personality they like to shed the blame for the loss on him. How funny! He actually looked Pakistan's best batsmen on show not only in this match but throughout the tournament. He was watchful, measured, demonstrated a commanding structure at the wicket & well calculated but others around him could not resist their instincts and could not respond to the scoreboard pressure and play with a focussed and clear mind. At least he stayed at the wicket, played to a plan, had a thought process in mind, tried to set a platform, fought hard right to the end, held the innings together & top scored for the team not only in this game but throughout the tournament and it was a successful tournament as Pakistan had the 2nd highest winning % and topped the Group A table so he deserves credit for the success in the first place as he was a key part of it as the above stat reflects. Anyway, if you are still using the one match semi final excuse for being against him at least he was not one of the players who shamefully got out cheaply against the Irish dibbly dobblers in the 2007 Caribbean World Cup disaster. At least he was not one of the players who were involved in the 5-0 whitewash humiliation against Australia (YK+Yousuf). At least with him we managed to reach the semi finals in the first place & had a respectable and successful campaign when the odds were against the team from the beginning.